Roman Expansion - The Punic Wars! The Big Idea: Maps and other geographic representations can be used to trace the development of human settlement (Ancient Rome) over time (throughout the Punic Wars). I can identify the causes and effects of the Punic Wars between Rome and Carthage. 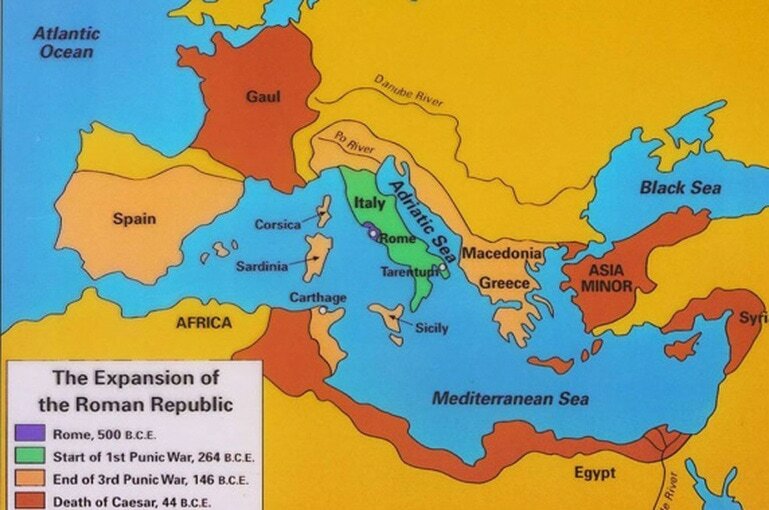 I can demonstrate the growth of the Roman Republic during the Punic Wars on a map. 1. View the video below about Carthage as you watch. 2. Fill in the boxes on the 1st page of your packet as best you can. 1. First do the PART 1: Punic Wars and fill in answers in your notes as you go. 1. Open up the document/file to the left. ​Learning Target - I can demonstrate the growth of the Roman Republic during the Punic Wars on a map. Follow the directions to create a map that shows the growth of the Roman Republic throughout the Punic Wars. Use the two maps below to help you! 6. Use color to show the expansion of Rome from before the Punic Wars to after. Include dates (either on map or in a key). Use a different color for each stage of expansion. *DO NOT INCLUDE RED LAND - this was won long after the Punic Wars. Go to your GOOGLE CLASSROOM and complete the Exit Ticket - Punic Wars. 1. Use your notes and the map you created to help you. One of the major impacts of these Punic Wars on Rome was the new population of slave labor it had when the final war was won. Any Carthaginian not killed by the Romans was taken as a slave. This meant 50,000 new slaves for the Roman Republic. Below is an activity that will teach you about slavery in Rome. Get a worksheet from the front table. Fill in the side titled "What Educated Guesses..." with any information you might know already about slavery in Rome. Fill in the middle section of the sheet titled "What I want to know" with any questions or topics about this subject (Slavery in Ancient Rome) that you are interested in finding out about. Now view the presentation and read the documents below about Slavery in Ancient Rome. Use the information you find to fill in the side of the chart titled "What I learned". Look to see if your questions were answered from the "What I want to know column". If they were not, circle the things you did not find and try to do a search for the information using google. Record your findings in the "What I learned" section. 1. Grab a GREEN sheet from the front table titled "Going Beyond - Understanding the Issues". 2. Follow the directions on the worksheet to complete the activity.